Bill Douglass, the founder of the Center for Basque Studies, was interviewed by Yvonne Gonzalez of the Las Vegas Sun for a Q + A in her piece about the Basque Fry Fundraiser in Gardnerville, Nevada. Since Douglass has been researching and writing about the Basques and Basque culture since the 1960s, he was the natural choice to ask questions about Basque cuisine, culture, history and how all of these aspects helped shape the American West into what it is today. He explained how the Basque cuisine is different in the United States than in Euskadi because of the different availabilities to seafood. He also talked about the history of Basque boardinghouses and how it shaped the way we think of Basque cuisine today, as well as the way Basque immigrants have been viewed in the United States and the fluctuating status of the sheep industry. It is a fascinating interview and if you want to learn more about Basque culture, history or the diaspora, this is a great read! One of the world’s most prestigious broadcasting institutions, the BBC, produces a radio show titled The Food Programme for its Radio 4 network. This show includes a special series on endangered foods, part of international project created by Slow Food to save foods at risk of extinction, titled the Ark of Taste, which among its many fascinating reports has included short descriptions of both the Euskal Txerria Pig and the Red Onion of Zalla (Bizkaia) – both topics covered here at our humble blog. In both cases, too, the reports make a compelling case for the intersection between food and human culture. Click here to listen to the report on the Euskal Txerria (3 min 56 sec). See a couple of posts we have done on Basque pigs here and here. Click here to listen to the report on the Zalla Onion (3 min 57 sec). See our post on these wonderful red onions here. We were notified at the Winnemucca, NV NABO Convention meeting that our good friend Ander Caballero was stepping down as the Delegate of Euskadi in the United States. This was very sad news in our community because, during his tenure as the delegate, Ander made many friends in many of our Basque communities across the country. 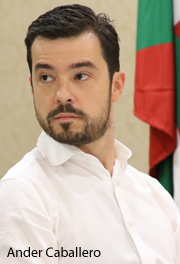 We have now been notified that the Basque Government’s Governing Council has approved his replacement, Jorge Fernandez Quintela. This appointment will go into effect as soon as it is published in the Official Bulletin of the Basque Country, which is expected to happen soon. While we look forward to meeting and working with Jorge, we wish Ander all the luck in his new endeavors and hope that he will not be a stranger. On behalf of everyone at NABO, a heartfelt Eskerrik Asko to Ander for all of your support over the years, and Ongi Etorri to Jorge. Zorionak bioi! Carmelo Urza, the founding director of the University Studies Abroad Consortium (USAC) and great friend of the Center, recently announced his retirement, ending a tenure on August 31 that began way back in 1982. To mark this auspicious occasion Urza was interviewed for Nevada Today, providing news from the Communications Office about the University of Nevada, Reno. Urza recognizes, though, that without the help of Bill Douglass and the (then) Basque Studies Program as well as Pat Bieter, a professor at Boise State, the program would never have gotten off the ground, with both involving their respective universities in financing the program initially. And from these solid foundations USAC grew into the global phenomenon it is today. Urza also speaks about his own Basque-American upbringing, growing up on a sheep ranch in southwestern Idaho, just off the Snake River, where he would go up into the Saw Tooth Mountains with a herder, camp-tender, and hand. From everyone at the Center, eskerrik asko Carmelo and enjoy your retirement!